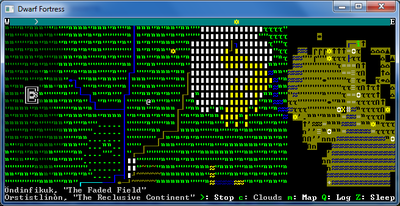 This guide provides step-by-step instruction for those who have never played Dwarf Fortress in Adventure Mode before. It assumes that you have already installed the game and can navigate the menus on your own, but no significant knowledge of how to play Fortress Mode is required. Read the full adventure mode documentation for additional detail. Some custom worlds which are interesting for fortress mode may be annoying for adventure mode for various reasons such as few civilizations, low population, certain races not existing, lack of access to metals, or history being so far advanced that many fortresses and towns have been abandoned. For your first game it's best to start with a generic world to avoid potential problems. You can come back to an existing world once you have the hang of things. See World generation if you need help with world generation. These settings should help avoid the aforementioned problems. Select Human of some civilization (not outsider). The first step in starting an adventure mode game is to choose the race (and civilization) of your adventurer. All three races can complete the same quests. Civilized Humans begin with bronze or iron weapons and can use any of the items sold by shopkeepers (who, for the time being, are only found in human towns and only sell human-sized clothing/armor). They also start with the widest variety of weapon skills. This is probably the best race to use when starting out. Human Outsiders can only start with Spear User and Knife User as weapon skills, and they cannot start with Armor User or Shield User. They also start out literally naked with no clothing. Dwarves have the advantage of being able to go into a martial trance when fighting multiple foes at once. They are the only race which can start with steel weapons, but they wear "small" sized clothing (like goblins and elves) which means that they're unable to wear human clothing and armor found in shops. Elves start with very weak wooden weapons and have a more limited list of weapon skills during character creation. They have the advantage that they have higher natural speed. Like dwarves they wear small sized clothing so will have the same problem finding suitable armor in shops. Select Demigod as your status. Even as a demigod you will probably die anyway. You can then choose to start as either a Peasant, Hero or Demigod. Each offers progressively more points to spend on attributes and skills. These three options essentially amount to how difficult it is to get started, so to make things easier for your first game you may want to just pick "demigod". These are the attributes you start with. They will go up as your skills increase which means that many of them can be raised in game, sometimes rather easily. Agility, Toughness, and Strength are probably the most important, in that order. Endurance keeps a character from getting exhausted too quickly in battle, and Social Awareness increases the number of followers you can have at one time. Other attributes to keep in mind in the future: Focus helps with Archer, Observer, and Ambusher. Willpower helps characters resist exertion/pain effects. Spatial Sense helps combat skills. Kinesthetic Sense helps with most skills involving any movement at all. These are less important to start out with, though, because they can be raised by doing various things in game, some of which are explained in the tips section. Some attributes like Musicality are currently completely useless. The others are either less important, easier to raise by doing things in game, or totally useless. Note that you won't have enough attribute points to increase all of these unless you set status to Demigod. Later you may find that you want to start with different attributes, but these are a good safe starting point. For example, you may find that later you don't care about the extra follower from Social Awareness and want to increase Spatial Sense or something instead, but for purposes of getting through this tutorial alive the extra follower will help. Read up on attributes for more information. These are what you start out with for skills, though you can increase them and develop others by doing things in game. The most important in the beginning are a specific melee weapon skill (such as Swordsman), and defensive skills like Shield User, Armor User, and Dodger. Defensive skills are absolutely critical if you don't want to die instantly. (See combat skills for more info.) Observer is important for avoiding ambushes, which often mean instant death if sleeping, and Swimmer helps to avoid drowning. Others such as Fighter are useful but increase rather easily on their own in game. The rest of the skills are relatively easy to raise in game or aren't that important at the beginning. Note that you won't have enough skill points to select all of these unless you previously selected Demigod as your status. As with attributes, you may later find that you want to experiment with different skill point allocations, but these are some good safe starting choices for purposes of getting through the tutorial. Read up on skills for more information. Most of the key commands you will need are noted in the text, but refer to the quick reference guide if you need to look up the key for a particular action. Your name and gender don't impact your character's ability, so feel free to do whatever you want with those. Once you have finished character creation, hit the Esc key at any time and select Save Game to save your game. You can then come back to it later by using the Continue Playing option in the main menu. You will usually start your adventure near a peasant hut. You can ask nearby commoners, using the k key, if you may be of any Service. They will then inform you of any problems their locality is suffering from, giving you a quest. In the beginning this usually means killing a nearby bandit. 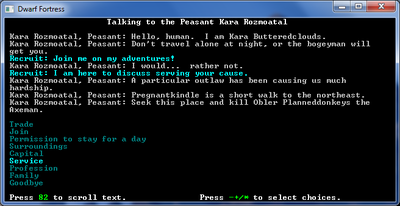 Walk into a hut, talk to a commoner, and get a quest. Feel free to ask some commoners to Join you if you want though most of them will refuse. Soldiers will make better companions anyway. Avoid traveling in the wilderness at night, particularly when you are alone. Fast Travel screen. A fort is on the west side, and a town is on the east side of the map. The regional map is displayed on the far right. So far you've been traveling around at normal scale, but this can be very slow for traveling between geographical regions. Using T will open the fast-travel screen and enable you to roam the land very quickly. Notice the uppermost bar indicating the position of the sun. Use m to open a zoomed-out overview map to further help you navigate. Much of the time, especially at the beginning, you need some companions to watch your back. The best place to find some is at a fortress. When in the fast-travel screen, press m to bring up the region map. Fortresses on the region map appear as small circles (marked as O on the map) and look like large buildings on the fast travel map. When fast-traveling, make sure that all of your companions are near you or some may be left behind. Move next to the entrance of a fortress and hit > to exit fast travel. Now move toward the fortress and you'll soon encounter the wall. You may need to walk around a bit to find the entrance. Once inside, if the fortress is not abandoned, you will find soldiers milling around. Use k to talk to them and ask them to Join you. At first you will only be able to get three followers but this is enough for now. If the fortress is abandoned, leave and try another one. Walk some distance away from the fort and go back to the fast travel screen with T.
Beware of sleeping in the wilderness at night! If you have to sleep outside, only do so if you have companions. Even if you do have companions, it will usually be better to travel drowsy until you reach a fort or town where it's safe to sleep. At this point you may have traveled enough that your character is tired. When your adventurer becomes tired, as indicated by the Drowsy attribute, it's time for some sleep. Move to a settlement of some sort, go into a building, and use the Z key to bring up the sleep menu. If you are in a private house, you must first ask the owner for permission before you can sleep. If a commoner is blocking you from entering his home, use the s key to crawl under his legs, and then the same key to stand back up. Use Q to bring up the quest screen. Using the + and - keys, you can scroll through the quests displayed on the right. Pressing z will zoom in on the current quest target, showing you the quickest path to reach it. The quest menu can also be used to pinpoint the location of many other useful sites and entities. Fast travel toward the location where your target is. When you get close, go back to the quest screen, hit z and you should get a more detailed map of exactly where to go. Once you are in the right spot, hit > to exit fast travel mode. In the upper-left corner of the screen you will now see a box with a list of icons and an abbreviation for a direction such as NNE (north northeast). One of these will be marked with TSK and that is your target. Continue to move in the indicated direction until you find the target that you're supposed to kill. Note that the target of your first quest may be in a camp (looks like ☼) surrounded by henchmen. Make sure to approach carefully and when you see one of them, let them come to you and let your companions attack first. If you attempt to kill the target(s) of your first quest with neither companions nor armor then you are very likely to die. Therefore, before proceeding make sure you have friends with you. If you do, you shouldn't need armor if you let them do most of the fighting. As you may have noticed by now, combat in Dwarf Fortress is quite complex compared to other games, so this section is kind of long. Please read it carefully though. When approaching a target it's usually best to wait using . to skip turns once you get close and let your target come to you so you can get the first shot on them. Positioning can be important because you don't want to let enemies attack you from the side or behind (!) and you should also try to move so that you're never fighting more than one opponent at a time. If you find yourself being shot at with ranged weapons, put a tree, hill, or other terrain feature between you and the archer and wait for some melee equipped opponents to come to you. Your followers will probably not be so smart though. For your first fight, you may want to let your companions take the lead anyway though as you won't have any decent armor yet. Press . to skip turns if you want to wait in one spot and let your friends advance and soften up some enemies first. If one of your companions dies, no big deal. You can just take his stuff by pressing g then get another follower later. If they die and you're outnumbered, just run away and come back later with new companions. If you want to be useful while sitting back and letting your friends charge in first, use t to throw objects such as rocks (freely available on many outdoor tiles by pressing g) at your opponent. If you're finding your first quest too difficult, and you manage to escape with your life, you can ignore the quest for a while, replace any dead followers, go ask NPCs about Surroundings, and try to find an easier camp or lair to attack. When you kill whatever "boss" is there, even if it not part of a quest, you can still go brag about it, raise your fame, get more followers, and then go back to the original quest. You can also just ask different people in different towns for different quests and perhaps find an easy one like killing a leopard. To attack, you can simply use a directional key to move your character as if to collide with your target. More effective though is pressing A when directly adjacent to a target in order to target specific body parts. At first your skills obviously won't be that great, so it's important to make targeted shots using A. Take the Easy strikes that are also Solid even if they target arms or legs. At first you're going to want to target limbs anyway because you're much less likely to be able to one-shot enemies with a blow to the head and you want to render them harmless as quickly as possible. If you get an Easy or Tricky shot to the head that is also relatively Solid, you might want to take it though. If every shot is difficult except for a body shot, take the body shot. Taking out an arm or hand can disarm your foe, cutting off a foot or leg will knock the opponent down and severely limit their movement, and anything causing severe pain can cause the opponent to lose consciousness making a followup headshot very easy. Cutting off weapon arms and a leg means they're almost as good as dead, so take note of what will most easily neutralize the threat before killing it. You may want to ignore such disabled opponents for a while and help your companions disable uninjured enemies. For armored areas, either avoid attacking them or attempt stabbing or blunt force rather than slashing. Frequently your weapon will get "lodged in the wound" making it unavailable for another attack until you free it. To free the weapon, use the directional keys to move either toward your opponent or step away/sideways. When your weapon is lodged in an opponent, they are unable to dodge. If you have another weapon, then getting 1 weapon lodged is extremely beneficial as you can then proceed to kill/neutralize your opponent without worrying about them dodging. However, they are still able to parry, and you are still able to miss. Remember - counterattacks are the most deadly attacks. If you want to attack an opponent in a difficult place, then don't - it's not worth the risk. Once your targets are dead, take their stuff using the g key. Immediately use w to wear any armor or clothing you gain. Decapitated heads can be left behind. When walking around, use the g key to pick up any equipment or item lying on the ground. These will then be added to your inventory i. Items may be sold later on to a shop at a nearby town (not hamlet). Once you complete your first quest, you can talk to any hamlet, town or fortress dweller to spread the news of your success. Though your quest log will direct you there, it is not necessary to return to the individual who gave you the quest to report your success. For now, always recruit the maximum number of companions. Later you may find that you don't need as many, though you'll usually need at least a few. Each time you report your success, your level of fame will increase. Once your fame has risen, more mighty warriors may want to join you on your way to glory. They can be recruited at fortresses or among the common peasants. Your companions will greatly increase your chances of survival and adventurers who care about such things should drop by the nearest fortress as quickly as possible. At any time, use the z key to display your status. This can be used to look for any scratches, bruises or missing limbs. To check on the status of your companions, use the c key to get a list of them (specifically, the ones within visual range) and a summary of their conditions, then press the key corresponding to the one you want to view up close. Alternatively, you can use the l key, which can also be used to look at any other item or creature within your range of vision. You may equip any items that you find or buy using the w key. If you are wearing too many items in an existing location, items must first be removed using the r key. To swap weapons you should drop the equipped weapon first, or put it in your backpack, then get the new equipment from the ground or rremove it from your backpack. Read the section on Adventure Mode Trading because how trading works is not entirely obvious, especially the fact that you must manually pick up your change and whatever you buy. Next you will probably want to sell of a bunch of junk you don't need and ideally buy some armor. To do this you'll need to find a shop. You can tell at a glance which towns have shops by looking for ■ (yellow, rather than the white ■ of houses) on the travel map. To find shops, go stand on a yellow ■ tile on the fast travel screen then press >. Walk around a bit and you should find some huts with signs outside. These are shops. You can walk inside and talk to the residents just like anyone else, except that residents in shops will be willing to Trade with you. Armor shops have a sign that looks like [ armor. The next thing you should do is work on getting a full set of armor unless you have been lucky enough to have already obtained one. You may want to go tromping around in the woods looking for animals to kill. Killing animals can be profitable because you can butcher their corpses with x and sell the products. Butcher and sell all animal corpses until you've managed to obtain a full set of metal armor. Meat is surprisingly valuable. You may need to visit several armor shops to find all the armor pieces you need. Somewhat more dangerous, but much more profitable, is attacking bandit camps. Just let followers do most of the fighting and concentrate on picking off severely wounded enemies until you get at least a helmet, body, and leg armor. And if some followers die, all the better. You can take their stuff and use or sell it. After you've armored up a bit, it's probably safe to go on the next quest. Get as many companions as you can and set off for your next target. You can also ask commoners about Surroundings which can reveal lairs and other hidden sites on the map, but you should probably avoid any non-quest lairs in the beginning as lairs and such can have creatures that you won't be able to handle at this point. See the Adventure mode FAQ for lots of tips and suggestions on how to avoid death and increase your skills. Congratulations, you have graduated from adventurer school. You can now keep doing quests, explore random sites, go find and explore an old fort of yours in one of your existing worlds, get lost in the underworld, or whatever you feel like. You may want to read though the full adventure mode documentation to learn about things that weren't covered here. This page was last modified on 3 April 2015, at 18:29.